Tomorrow, The Met launches its second season of the “Metropolitan Opera: Live in High Definition” – simulcasts at the multiplexes in those cities, among more than 600 movie theaters, performing arts centers and universities worldwide. That’s triple last year’s number. Leading off is Charles Gounod’s sensuous “Roméo et Juliette,” starring Netrebko and tenor Roberto Alagna as the doomed lovers, with another legendary tenor, Plácido Domingo, at the podium. As opera lovers savor the last of this season’s simulcasts April 26 – Gaetano Donizetti’s sparkling “La Fille du Régiment,” with soprano Natalie Dessay in the title role and Flórez in the part that made Luciano Pavarotti famous – “Live in HD” will reach an audience approaching 1 million. After the Met kicked it off, the rest of the arts and cinema world followed and the phenomenon seemed to grow and grow, with non-live HD play-outs of Glyndbourne Opera in the UK and announcements of the beaming of La Scala to the US. Even other stage-related performances all across the world found favour with local audiences, be they the Royal Dramatic Theatre in Sweden or the Australian Ballet in Sydney, both going out to small towns and villages i the outback normally not touched by this sort of culture. NATO president John Fithian himself declared that he was surprised by this trend. A landmark revenue sharing agreement with the International Alliance of Theatrical Stage Employees (IATSE), American Guild of Musical Artists (AGMA) and the American Federation of Musicians (AFM) paves the way for these digital cinema presentations and other electronic media projects. The parties have reached a tentative agreement, pending final ratification, for a four-year experimental agreement that involves a supplemental media fee to clear vastly expanded rights for up to six titles per year. In this new agreement, union members would also participate in revenue sharing on top of the supplemental fee. Earned revenue received by San Francisco Opera, less 20% to the Company as a flat all-inclusive distribution and administration fee, would be split 50/50 with the unionized groups, the conductor, and the designers. The Company’s significant capital investment in technology allows for revenue sharing from the first dollar earned rather than from any calculation of net profits. The New York Times has a very good article looking at the whole trend of operas-with-popcorn. It also nails the key differentiator between the Met and the SFO that could further spell the difference between ‘Encore!’ and ‘start sweeping up the popcorn’ for cinemas, which is that “the Met shows its operas live. San Francisco will transmit them after the fact.” While Glyndbourne found and audience, opera lovers prefer their product fresh rather than caned. Next year we are likely to see big hitters like the Covent Garden’s Royal Opera House enter this space and with it there will be increasing segmentation between A-list and non-A-list operas. There will also be a renewed look at the exclusivity that some of these distribution deals entail for cinema chains. In the case of alternative content for digital cine,a it seem tp be that it ain’t started at your local ‘plex until the Fat Lady sings. 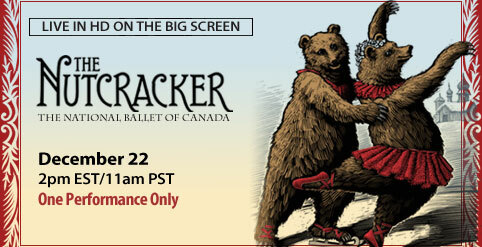 Update: In addition to the ones above, the Washington National Opera is beaming to US college campuses (see here) while north of the border, the National Ballet of Canada is giving Cineplex patrons a taste of The Nutcracker shown live on 69 screens. Detail here.